Do you have a leaky basement or Flooded Basement? Does your basement feel humid? Does your basement show visible moisture spots? Does your basement produce a musky or moldy smell? If your answer is yes, then your basement is showing signs of water damage. Water damage in your basement can be caused by leaking pipes, Clogged Drain, or cracked foundation walls or floors. 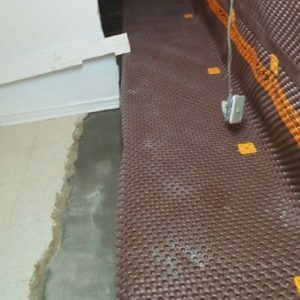 Draintony provides Basement Waterproofing you can trust in Toronto, Scarborough, Vaughan, Mississauga, Oakville and many more areas for premier Basement Waterproofing service, premier Basement Waterproofing quality. Avoid experiencing a leaky basement or Flooded Basement in your properties. Don't wait for a Basement Waterproofing emergency. 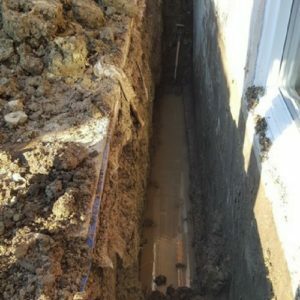 We are licensed drain plumbers and insured experts. Call us now at 416-938-5102 or Contact us today to Get a Free Quote for Basement Waterproofing! Is moisture infusing through the walls and floors of your basement? Having a wet basement is a serious health hazard and can be a great danger to the structure of your residential property. 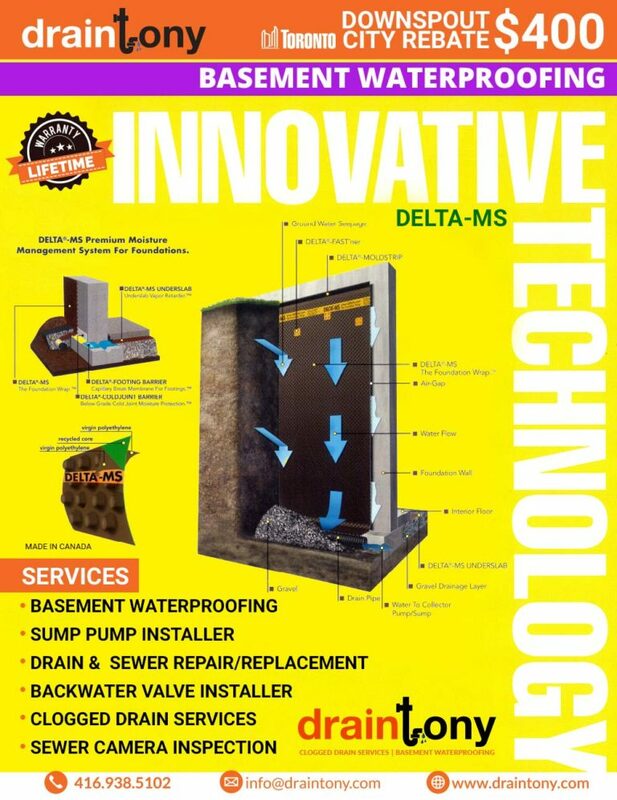 In order to get rid of this moisture, Internal Waterproofing your basement is the only solution. 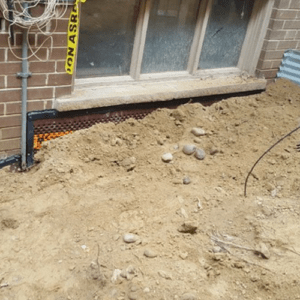 Internal Waterproofing is ideal if you are concerned about disrupting the outside appearance of your residential property. Internal Waterproofing is used when the source of moisture is coming from the inside of your house. This method reduces moisture in the house, diverting water away from the basement via Sump Pump Installation or Weeping Tile Installation. Can you smell bad odors in your basement? Do you see water dripping from wet spots on the roof? These are some of the signs from your house indicating the need for repair and proper maintenance. 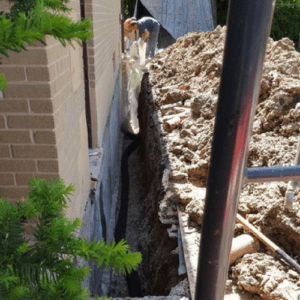 In order to protect your house from water problems like a Flooded Basement, External Waterproofing your basement via Window Well Installation is the only solution. External Waterproofing structurally ensures the life of the wall and the building it supports. This method stops seepage of water into the house and protects it from frost and foundation erosion. 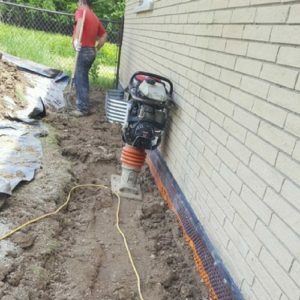 External Waterproofing involves excavating and exposing the foundation wall to prevent water from penetrating through the foundation. 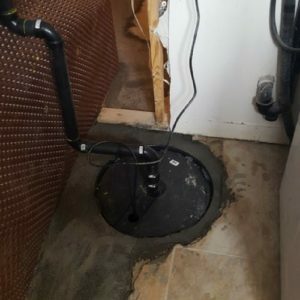 Sump Pump Installation is one of the most important things you can do to prevent basement flooding. A submersible Sump Pump can be installed into an ABS pit with a cover below the concrete level. The discharge is directed outside. 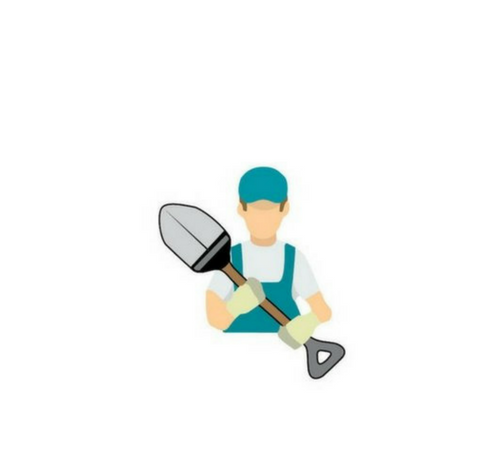 To handle ground waters on any rain, the pit must be tied into the weeping tile from the new waterproofing or in the older system if it is in good condition. Weeping Tile Installation is a porous pipe with small slits or weep holes in it. Weeping Tiles can be connected to a Sump Pump. 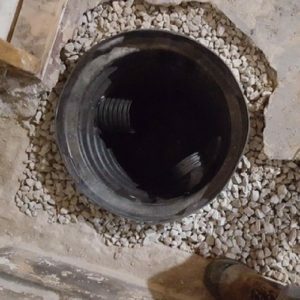 When the water is absorbed, the Weeping Tile drains into a solid pipe leading direct into a sump pit, where the water collected in the sump pit can then be removed by a Sump Pump. Concrete Floor Installation comes with a full dry basement package, including new undergrade internal sanitary drains. Dry basement guaranteed. Draintony provides 25 years warranty! 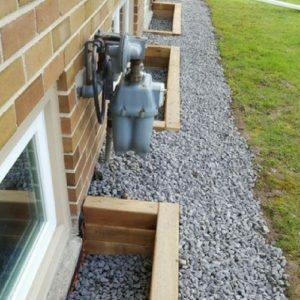 Window Well Installation is an effective way to prevent unwanted water from entering your basement. Window Wells will keep your basement clean and dry as it helps to collect water when it rains or snows. Window Wells also prevent moisture damage to the windows themselves by preventing soil away from them. WHY DO I HAVE A LEAKY BASEMENT? 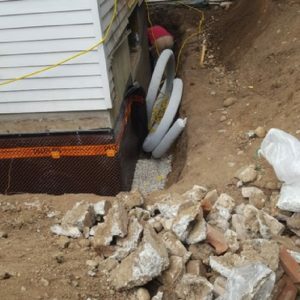 When a basement is excavated, the soil that will be backfilled around the new foundation will be much looser and collect water faster than the surrounding, undisturbed virgin soil. 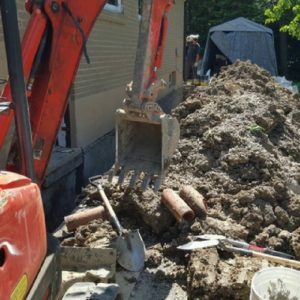 When the foundation walls are poured and the ground is backfilled, the soil surrounding the new foundation will collect water and hold that moisture up against it. Water will eventually accumulate and enter into the foundation walls as they age and deteriorate causing your basement to leak. Whether you live in an older home or one that’s newer, foundations that leak cause all kids of damage to your basement walls. If your basement is leaking, it’s important to get it repaired as soon as possible. 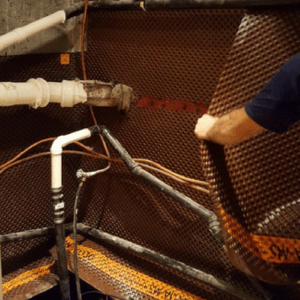 Even if it’s not leaking, it’s a good idea to add that extra layer of protection such as Internal Waterproofing, External Waterproofing and Sump Pump Installation to prevent damages in the future. 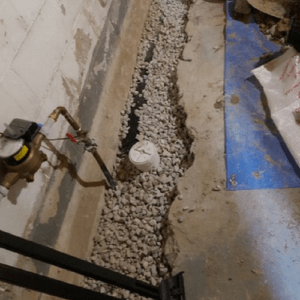 WHY IS IT IMPORTANT TO STOP A LEAKY BASEMENT? Do you want to pay thousands of dollars in structural repairs? Moisture can cause all kinds of damages to bricks, concrete and block structures. Therefore, maintaining a dry basement is more important that you think, as mould spores can travel throughout your home and could be detrimental to the health of you and your family. A leaky basement is good breeding place for harmful mold spores and if not treated immediately, it can result in many health risks such as asthma, headaches, and skin allergies. A leaky basement is dangerous as it can cause severe problems like cracks in the foundation or walls of your home. 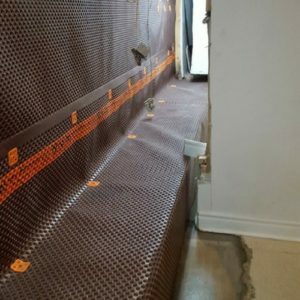 Did you know Basement Waterproofing is a valuable feature that can increase your home's value by up to 20%? Basement Waterproofing ensures that your property is protected from flooding when it rains or snows. 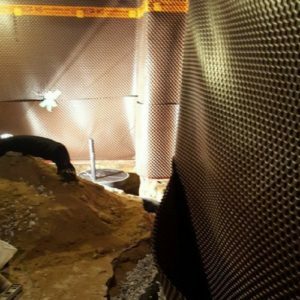 Basement Waterproofing prevents your basement from constant wetness or dampness that is capable of wearing the foundation of your home. I HAVE A LEAKY BASEMENT! IS YOUR BASEMENT PROTECTED FROM A FLOOD? 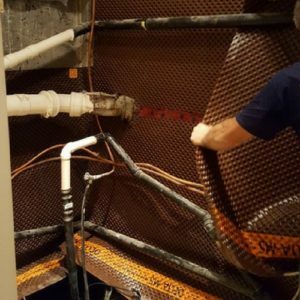 Is your basement internally and externally waterproofed? It is important for your home to be internally and externally waterproofed. Internal Waterproofing is used when the source of moisture is coming from the inside of your house. This method reduces moisture in the house, diverting water away from the basement via Sump Pump Installation or Weeping Tile Installation. External Waterproofing structurally ensures the life of the wall and the building it supports. This method stops seepage of water into the house and protects it from frost and foundation erosion. Do you have a sump pump installed? One of the most important things you can do to prevent Basement Flooding via Sump Pump Installation. A submersible Sump Pump can be installed into an ABS pit with a cover below the concrete level. The discharge is directed outside. To handle ground waters on any rain, the pit must be tied into the weeping tile from the new waterproofing or in the older system if it is in good condition. Did you disconnect your downspout? 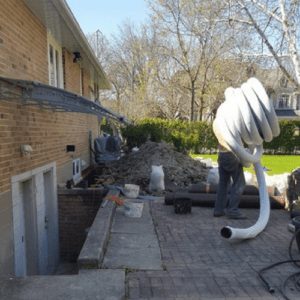 Downspouts disconnection is the process of detaching the downspouts from the pipes or the paved areas and redirecting water to flow into the lawn, a garden or a rain barrel where it will soak into the ground. It is the redirection of the gutter to discharge free in garden areas and reduce runoff from a property. Do you have a backwater valve installed? You can protect your property from Sewer Backup by installing a backwater valve on the main sanitary drain. A backwater valve is a cost-effective device which allows a one way flow from your home to the sewer and closes up as soon as backflow is detected.